Histograms can be found in almost any modern image editing software. It is my guess that most current digital cameras, including some compacts, can display histograms as well – some even live as you shoot using your LCD screen. Such a persistent inclusion would suggest that histograms are quite important. Even so, many beginner photographers don’t seem to understand what they show. There is nothing wrong or shameful with that, as histograms may appear to be rather complex at first. Truthfully, they aren’t. In this article for beginners, I will try to teach you how to understand histogram. Hopefully, by the end of this tutorial, you will learn to “read” them and see if they are useful to your photographic needs. A histogram is a graphical representation of the tonal values of your image. In other words, it shows the amount of tones of particular brightness found in your photograph ranging from black (0% brightness) to white (100% brightness). As shown in the image above, dark tones are displayed on the left side of the histogram. As you move rightward, tones get lighter. The middle portion of the histogram represents midtones, which are neither dark nor light. Vertical axis of a histogram displays the amount of tones of that particular lightness. Histogram is exposure-dependent, but is also affected by tone curve and other settings. 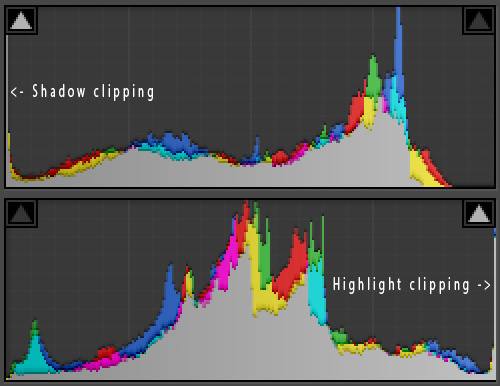 If a certain portion of the histogram is “touching” either edge, it will indicate loss of detail, also called clipping. Highlight clipping (areas that are completely white and absent detail) occurs if the graph is touching the right side of histogram. Shadow clipping (areas that are completely black and absent detail) occurs if the graph is touching the left side of histogram. Either case can be often fixed by altering exposure settings. However, you must remember that it all depends on the scene. For example, if there’s sun in your image, it is only natural it will be so bright – completely white, in fact – that highlight clipping will occur. Read our Mastering Lightroom series article “How to Use the Basic Panel” to learn how to fix exposure errors with RAW files. If you want to see whether there is any clipping as you photograph, engage histogram in your camera as you review images. Each camera is different – Nikon cameras, for example, usually require you to press navigator keys up or down a couple of times in review mode before the correct settings come up. 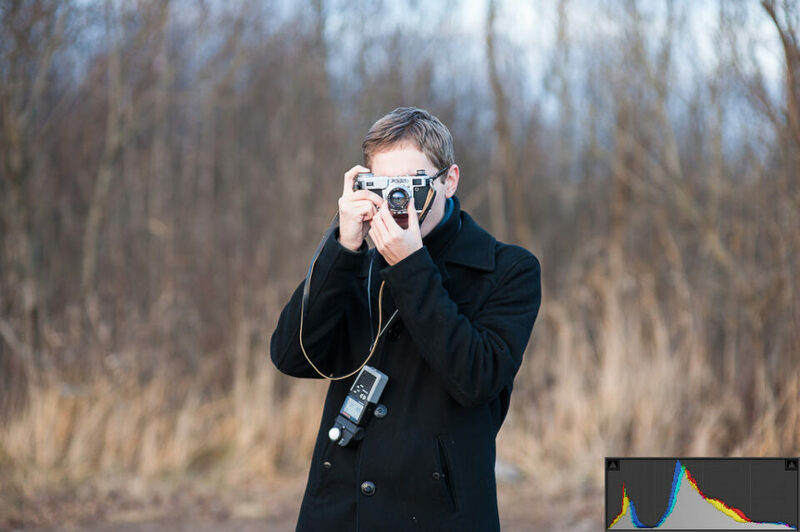 Many current DSLR cameras have live histograms that react to scene in real time. To engage live histogram, you will need to use the LCD screen of your camera to photograph instead of optical viewfinder (Live View mode). Should you notice any highlight or shadow clipping, alter your exposure accordingly: to save shadow detail, make images brighter by dialing in positive exposure compensation value (+0.3 or +0.7, for example); to save highlight detail, make images darker by dialing negative exposure compensation value (-0.3 or -0.7, for example). Exposure compensation is usually set using “+/-” button on your camera. If you prefer to shoot with manual settings, just change ISO, aperture or shutter speed accordingly. Read this article to learn about each of these three exposure settings. Histograms usually display information for three primary colors – red, green and blue – and are known as RGB histograms. Such is the histogram shown above. You will notice that it consists of several diagrams marked with different colors. Three of these diagrams represent red, green and blue color channels accordingly. Gray diagram shows where all three channels overlap. Yellow, cyan and magenta appear where two of the channels overlap. Some are used to seeing histograms as graphical representations of exposure. Quite a few photographers are thus used to evaluating exposure based on histograms alone and state them as either “good” or “bad”. Usually, a “good” histogram would render most tones in the middle portion of the graph, and no or few tones would be found at the extreme edges. A “bad” histogram would have tones at the very edges of the graph, which would basically mean either underexposure to the point of lost shadow detail (shadow clipping), or overexposure to the point of lost highlight detail (highlight clipping), or even both in a single image. If we agree with such an approach, the histogram shown at the top of this article would represent an image that is ever so slightly underexposed (tones are shifted slightly to the left), but mostly ok.
Let’s see if such a theory is correct by examining the following photograph. I used Lightroom to process three different virtual copies of it. The first copy shows an underexposed photograph (too dark). As you can see, most of the image lacks any sort of bright detail. Histogram clearly shows a strong shift to the left side with most tones in the shadow range, and some are even clipped (completely black). The following image is overexposed (too light). Many tones are very bright and there are basically no darker tones. A large portion of the image is blown-out (completely white) and bears no detail at all. As you can see, the histogram confirms that the image is much too bright – it is shifted strongly to the right. 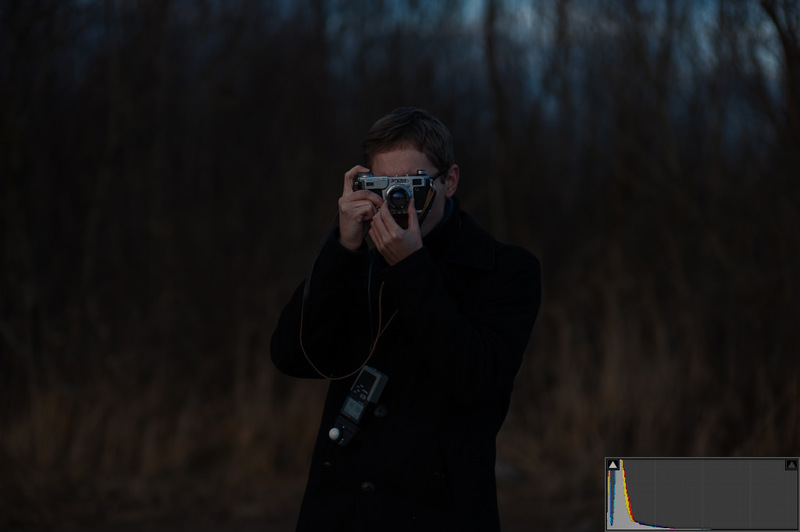 Can you see a small amount of midtones displayed in the histogram? They represent my coat, which, in real life, is black. 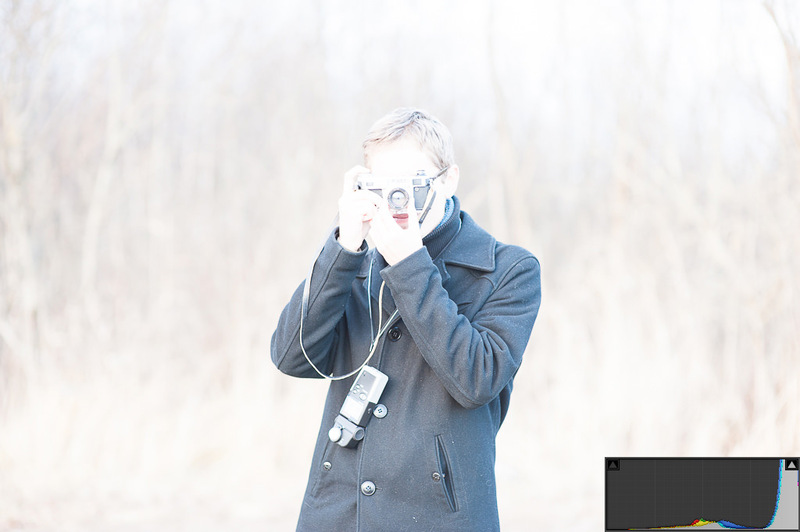 The tones of my coat should be shown at the left side of the histogram as “shadows” in a well-exposed image. Let’s see if that is true by looking at the following image. It is exposed correctly and bears a much broader tone distribution with most of them found in the “midtone” section of the histogram. Let’s analyze the histogram of that last image. As you can see, there are barely any tones at the extreme left-side of the histogram, where blacks are shown, which means there is no detail lost in shadows. Then we see it spike – as mentioned earlier, this portion of the histogram shows the tones of my black coat. It is sufficiently dark, yet still bears enough detail. Note that the spike ends with blue channel – it represents the tones of my scarf. Moving leftward, we see a decrease in the amount of lighter-than-my-coat tones. Clearly, if we examine the photograph, the coat is more or less the darkest element of the photograph (along with the fake leather of my Kiev 4AM rangefinder). Any other portion of the image is significantly lighter. Then we see our histogram spike up quickly again. These values represent the background, which is moderately bright and takes up the biggest portion of this particular photograph. Histogram confirms this. Gradually, as the tones get lighter, their amount decreases – that’s where information about the lightness of my face and sky is represented. Both these areas are small, but noticeably lighter than the background. Finally, we end up with a small amount of highlights. We can find them in the lightest portions of the sky as well as the camera I’m holding. 5) Should you Set Exposure using Histogram? Based on these samples, a “good” histogram – one with most tones stored in the middle portion – does in fact indicate correct exposure. Does that mean histogram can indeed be used to judge exposure? Not quite. Let’s examine one more example with a completely different histogram to the “good” one shown earlier. 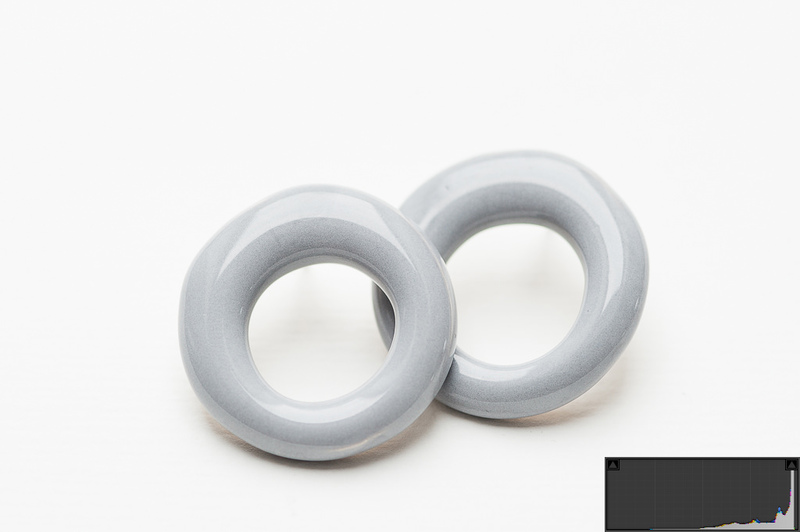 It is a product shot of a couple of earrings. As you can see, histogram is shifted heavily towards the right where bright tones are represented. If you were to judge the exposure of this particular photograph based on the histogram alone, you would probably say it is overexposed considerably. There is barely any sign of midtones, let alone shadows. However, would you say that the image above is not exposed properly? Should I alter my exposure settings and aim for the “good” histogram, this photograph would be much too dark. A simple conclusion can be drawn, then: the histogram is not necessarily good for evaluating your exposure. The “correctness” of it depends on too many factors, not the last of which is your vision as well as the scene you are photographing. Histogram merely shows you the amount of tones of various brightness levels in your image, and nothing more. It can be used to discover whether you have clipped any highlight or shadow detail at specific exposure settings. You can use it as a guide to avoid such loss of detail as you take pictures, and that is where histogram excels. As long as you keep that in mind, in general, there is no “good” or “bad” histogram. Some photographers made a habit of glancing at histogram on the back of their camera LCD screen after each shot – mostly to check whether there are any tones at the extreme edges that would indicate loss of detail in dark or light areas. However, I never seem to find enough time to do it myself. It doesn’t make you more of a professional if you use the histogram, but learning how to read it can be invaluable at times. Hopefully, this article helped you to understand what histograms show and how to read them. Perhaps, with time, you will learn to use them. And if you feel it may be an unnecessary step for you, there’s nothing wrong with that either. this was a good informative post . I am new to digital photography, and was not to clear on hisograms. this helps . thank for posting it . I am always ever so pleased to see the various articles that are posted on your website and always look forward to seeing anything from you guy’s. There is never a day that is not another school day. I started photography as a pass time and now it is turning out to be my big passion. Thanks to the very instructive posts that you guys do and although I have caught up on most it is never a loss to brush up a bran that is not getting younger by each passing day. Thank you for the wonderful posts. Thank you, Peter, for your kind words. I’m glad you find our efforts of use! Coincidently, I’m in a course about Photoshop Camera RAW and we had a complete lesson dedicated to the histogram. According to the teacher, the highlights and the whites are in reversed order in the first figure you posted. Highlights should be in the most right corner instead of the withes. Is that correct? Perhaps, Pascal, it is wordplay. Highlights are bright parts of the image, just like shadows are darker ones. Whites, on the other hand, are “white” and are brighter than highlights. There are not any details in “pure” black or “pure” white. Shadow or Highligts, even if rendering as black or white on a photograph have details that could show if you change the settings in your camera or on your computer. Anciently, before digital photography, you could do it in your darkroom if the combination of exposure and latitude of your film allowed it, a more time consuming procedure, and a lot costier too. Thanks for the post and comments. Both are a source of knowledge. There are some really good points in the article. I teach my photography students to push the exposure to the right without clipping important highlight detail. The way digital works is the noise is most prevalent in the dark portions of the picture. If a low contrast scene can be shifted to the right, the amount of noise is decreased. Then I adjust the shadows in post if I want more contrast. Also when posing someone in the shade or under a diffuser, I will have to wash out the background. The important element of what to retain is the IMPORTANT detail. Tim, you are quite right. There will be a separate article on “expose to the right” technique. I didn’t want to overwhelm beginners, there’s quite a bit to understand already. I enjoyed your article and look forward to your “expose to the right” article. This is a great resource for my early photography students. > I teach my photography students to push the exposure to the right without clipping important highlight detail. This was a nice simple explanation for beginners. You are a well known guru. It would be better to be courteous rather than cryptic and simply offer your thoughts on how to balance exposure and ISO decisions. Surely you can explain your POV in a way beginners can follow, right? I asked a simple question. I wanted to know if Mr. Mielke considers ISO while teaching ETTR, and if so than in what way. Hi, I’m interested in how ISO comes into play too. I usually ETTR but I was reading a thread on dpreview the other day talking about how sensors switch from analog to digital amplificatoon at a certain ISO level. The way I interpreted that was that you are better off underexposing at that analog ISO limit and then boosting in post (when shooting RAW). Is yhat right? Ive been unable to find any more info on this on the net – has anyone seen a link about this? Also how do I work out what the optimum ISO limit is on my D700 and OMD? It would be great if the follow-on article touches on these topics. Thanks for taking the time yobwrite this article, beginners will find this really helpful. Pete. Apologies for the sloppy typos (written from my phone)! Pete. It depends on the camera. It is important to realize that while setting ISO on the camera higher than “base” one is going to lost a stop in highlights with each ISO stop. However it is not necessary that he is going to gain a stop in shadows, sometimes it is half of a stop, sometimes none at all (like it is with Nikon D7000). Essentially from the point of view of capturing light on the sensor, raising ISO setting in the camera and setting faster shutter speed (or smaller aperture) is underexposure; while ETTR suggests to get maximum exposure possible. ISO setting on a digital camera is not a part of exposure, same as pushing or pulling film in development is not a part of the exposure. It is better to experiment with your camera to check where ISO bumping starts to give no benefit in terms of shadow noise (and this can happen before digital multiplication kicks in). Simultaneously you may discover that the base ISO is not providing the cleanest possible shadows, but setting ISO 1 to 2 stops higher than base makes shadows to be artifact-free and clean enough to pull details from those shadow regions (especially if you are on one of the Canon or certain SONY cameras). Hi Iliah, thanks for your detailed reply! I will run some tests on my two cameras to see where the ISO ‘limits’ are for them both. Thanks, Pete. Thanks for the detailed post. I teach my students that the lower the ISO the better quality the picture. In reality most pictures are exposed with the exposure in the middle because of the vast amounts of contrast. The ISO is not part of the exposure? I believe I understand what you are getting at. The raise in ISO is electronic and different in how film ISO works. I also understand the quality loss involved with film push and pull processing. And therein lies the key — without clipping highlights. Unfortunately, I have found that it is very easy to clip the highlights when ETTR. In the fall of 2011, Ctein posted an interesting article on TOP about ETTR. While he admits that there may have been value to ETTR in the days of noisy sensors, modern sensors can underexpose then in post-processing you can adjust exposure with little noise and without clipping the highlights. It’s a very interesting article and provides some perspective on the evolution of sensors and ETTR. I have read several articles on this topic but none of them were simple enough for me to understand…until I came across this one!!! One of the things I like that you guys at Photography Life do is make it easier for people to understand. This is what keeps bringing me back to this site and now, it has become a habit of me to check this web site everyday…first thing in the morning! Awesome job and keep up your wonderful work. I started developing a passion for photography from my teenage ages(rightnow I am in mid 30’s). I believe I have the ‘eyes’ for photography because I somehow end up taking better pictures than most of the people that I know do and I always visualize a shot before I actually take a shot. Recently I started learning more about Photgraphy and eventually want to do part-time wedding/birthday shoots. Would you have any advise on how I can organize my path to achieve my goal??? Thanks for this simple-to-understand article. Please add the +1 to the articles (as you added the Facebook like) so I can Plus it. Good article, it helped me understand histograms much better. One question and a grammatical point. In the caption below the overexposed image (4.2) you say “The tones of my coat should be shown at the right side of the histogram as ‘shadows’ in a well-exposed image.” I thought shadows were rendered on the left side of a histogram. Also in the article you use the word “bare” several times when describing the characteristics of an image as in: “It is exposed correctly and bares a much broader tone distribution….” This is an incorrect use of that word. “Bare” means lacking covering or clothing as in “bareheaded” (without a hat). The proper word in the context of your discussion is “bear” of which one of its many meanings is “to have a feature or characteristic”, and I believe is what you meant. Sorry to be a stickler on grammar, maybe it shows my age. Thanks for all the good information you provide, keep it up. I appreciate you taking time to highlight these errors. You are indeed right – I mixed up the sides in point 4.2 as well as the word “bare” with “bear”. English is not my first language and I sometimes mess up my grammar if I’m in a hurry. I sometimes need Nasim to proofread and I’m deeply embarrassed by that. Thank you so much! All fixed now, I hope. Great post! Funny I was talking with a friend of mine about this same subject and I was reading several sites on learning how to read the histogram better but this is, BY FAR, the best explanation I have found…I even bookmarked it! Need to practice more though and, like you said, even though I will encounter situations where using the old-fashioned in-camera meter is best I still think this helps out a lot. Thank you once again for writing a well though and explained article. Thanks for your continuing series of posts on photo techniques. Well done! Now I understand histograms. Thank you Romanas ! Nice article. I had a pretty good understanding of histograms before reading but still enjoyable. Thanks Romanas! Thank you! I love your articles, it makes me understand the functions clearly. Perfect for beginners! Neat and clear explanation. Loved your article. Extremely useful for beginners. I learned a lot by following your advice. Thank you. Recently I changed the D7000 kit with 18-105 with D600 and a series of objectives which I thought appropriate. I spent so much money on a 16-35 f :/ 4, a 24-120 f :/ 4 and a 70-300 f :/ 3,5-5,6. I’m not satisfied. The photos taken with the D7000 were nicer, with more intense colors and brilliant photo is not flat like the ones I do now with the D600. In the white balance, saturation?, In contrast? Could you help me to set correctly the D600? RAW files are supposed to be flat-looking – they have no contrast, sharpening, tone curve adjustment or saturation applied. Making RAW files into punchy JPEG is a matter of post-processing. So you have to always make the post processing? If you want to shoot RAW, there’s no way around having to post-process. If you want to use images straight out of the camera, choose JPEG files. If you find them to be too flat-looking, you may change the look through camera menu. To do that, go to your Shooting Menu -> Set Picture Control. Choose Vivid for punchier color. You can manually tweak the settings, too. Up the Saturation for more vivid color, increase Contrast for a less flat look. OK, many thanks for the advice. This weekend I’ll do the tests. I like how you make it clear that the histogram is just a tool for the photographer, it is not a measure of “goodness” or “badness” of a photo. i always used to ignore checking histogram as i wasn’t knowing anything about it( beginner), after reading this post i realized its important. Thanks for your wonderful article. I am confused with the dynamic range within a single frame recently. As you mentioned above, histogram shows clips occur on either edge, indicating the tone of this part is out of range. Thus i believe histogram could provide the information of dynamic of a picture. Could it? If take your shot as example , what’s the range expressed by numerical range of EV? I made a Photo Extension Histogram app for Apple Photos for the iPhone and iPad. I hope you like it! my photography teacher, mr. dolan, made me read this article. i read it entirely. he teaches us so much knowledge even though he looks like a clarinet player. it is quite amazinng! by teaching us about histograms, he makes us better people. shoutout to mr dolan find him on ig probably i dont really know to be honest. but yeah, he’s one of the realest. Thank you. This was very helpful in explaining how to read a histogram. I am doing a course in photography and I am very raw at it. I am enjoying learning about the camera.